An early 19thc pair of superb quality mahogany hall chairs with a carved scallop shell design & excellent patina (colour). 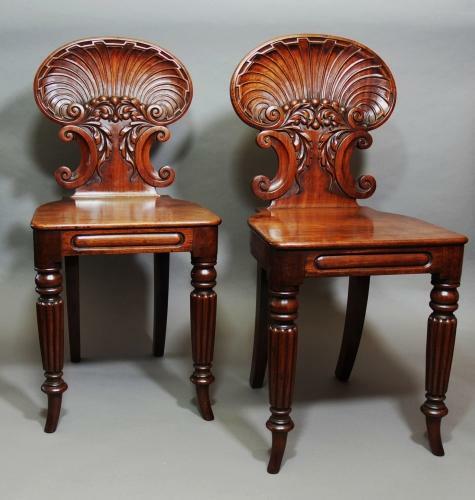 The solid mahogany backs of scallop shape & carving also have foliage decoration leading down to C-scroll supports. The seats are solid mahogany leading to a carved front rail. The front legs are turned & reeded terminating with a splay foot & the back legs are also of splay design. These are in excellent condition & are structurally sound. There is evidence of old repairs but no breaks. These type of chair can often be found to be quite unstable but these are in superb condition & can go straight into a property.